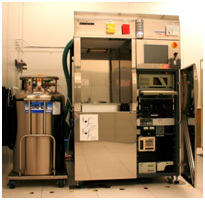 A stand-alone, single wafer etcher with one reactor and a manual wafer loading system. The reactor has a decoupled, high density ICP plasma source. It is designed specially for deep reactive ion etching (DRIE) and high aspect ratio etching of silicon using the Bosch (switched) process. On this tool, the chuck is cooled using a flow of liquid N2. This makes it possible to keep the substrate at very low temperatures during processing and use so-called cryogenic silicon etch process using SF6 and O2 gases. The normal operation mode is still the Bosch process. In addition, it is also possible to perform (continuous) RIE etch processes such as etching of dielectric materials like SiO2 and Si3N4, some metals (e.g. Pt), and organic materials.